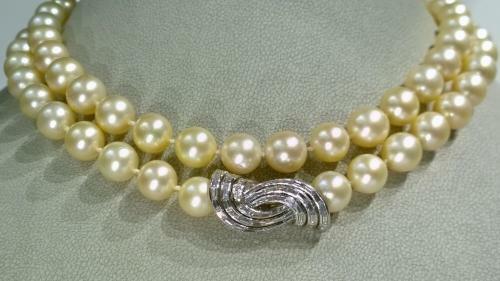 A stunning single row cultured pearl necklace, comprising 10-10.5mm uniform pearls, 32 inches long, opera length. On platinum clasp set with approx 2.50 carats of baguette cut diamonds. They are very well matched with good lustre and even shape with very minor to no blemishes. The colour is a pleasing pale cream/pink, they date from the mid to late 1950's. Necklaces of this quality and size are a very rare find.